Adapted by Neil Bartlett and directed by Kevin Spence as his final production for Doncaster Little Theatre as Artistic Director. This promises to be a captivating theatrical experience and a must see for any Dickens fan. Bartlett has lovingly and carefully adapted Great Expectations so that all the words spoken are taken directly from the novel- in Dickens' own words! A host of unforgettable characters – the ghostly Miss Havisham, the desperate convict Magwitch, the icy Estella and the warm-hearted Joe Gargery – all spring to life in Neil Bartlett’s inventive and atmospheric adaptation of one of Dickens’ best-loved and finest novels. 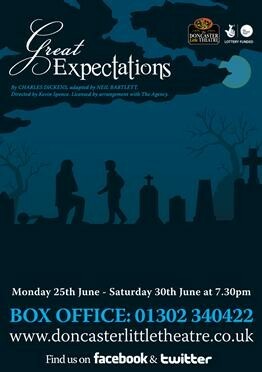 This gripping tale of terrors, hopes, dreams and regrets is Doncaster Little Theatre’s contribution to the Charles Dickens 2012 bicentenary celebrations. Doncaster Little Theatre is a vibrant Community Arts Theatre with an in house company of local residents who participate, produce and perform in the shows on a voluntary basis. They are also responsible for running the theatre.